I grew up here in Cedar Rapids, as Lori Oettinger. My new husband added the Thompson part. I buried my Mom and Dad here, I made lifelong friends here. My sister Peg is still in the family house with all her babies (pets). I left in the early 80’s and what a ride it’s been! After traveling around the country. Work took me to New Orleans where I lived for a few years. I ate that city up with a spoon. Casino’s hired me to open up new properties on the Mississippi Gulf coast. I opened three. Loved it. I lived in my little cottage house until the very end of 2005. After 20 years, the locals quit calling me a “Yankee” I miss them all. Every year, I would load up a big old cooler with Shrimps that were swimming the day before and head home to Cedar Rapids. Spent time with Dad and Peg, and then Mike at Pohlenas’ would load me up with Iowa Chops to take back down. I remember every year standing in front of the Nelson’s, Hy-Vee, and Pohlenas’ meat counters staring at red meat. We have great seafood but our cows and pigs seen to be on a perpetual Jenny Craig diet. My southern mentor. Her name was Jane Winborn. She called me “Butterbean”. I learned a great deal from her. You see, Jane was the daughter of a slave in North Mississippi; her father had only worked a couple years as a slave. He was 6 years old when his Papa was freed and given a great deal of Timberland in appreciation for his services. Wow! (really?) It is a sad history, but the truth. Miss Jane taught me to make wonderful southern foods. She drank white liquor on Saturdays and chewed tobacco. I fell in love. She could do no wrong in my eyes. I’d bring her down to Gulfport from Stateline, MS. She’d stay with her sisters, her grandson, or when I was real lucky, with me. Her family took her up north for her last years. Her kids called me from Detroit and told me what she had asked them to relay to me. It was about my cooking. She said “Tell that Old Butterbean, she done good” It’s her pan fried chicken on the menu here. I miss her. So, life goes on. Left the casinos and went to the Village Sports Pub in Biloxi to work. A snow bird haven. What a wonderful life down there. 5 days would change all that. Old girl (Katrina) changed her mind in the middle of the night. We all got quiet. The new coordinates had her coming right for the MS. Gulf coast. I saw this beautiful 2 stall garage during the first squalls completely intact and lofting softly across the field behind us. I made everyone look at it and then to break the silence and fear for what was coming, I quoted “Forrest Gump” I said, “and all of a sudden, GOD SHOWED UP!’ I’m the only one that thought that was funny. Oh well, A car battery hooked of to an old T.V. gave me news 15 minutes every hour until overheating. We holed up across town, a little more inland. Not inland enough! My friends and our animals. I checked on friends and employees until the last cell tower went down. Sounded like an 800 pound person yelling at the top of their lungs for 9 hours. 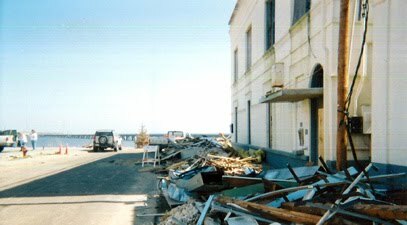 She made landfall down the coast in Waveland and Bay St Louis Mississippi. Took us awhile to get out. All was gone. I won’t go deeper into this as the losses are still quite personal and too painful. I came home. I was lost. Didn’t belong anywhere. It was long phone calls to friends around the country that had survived, and the constant support of my childhood friends here in Cedar Rapids. My sense of humor kept me from completely going bonkers. 6 years have passed now. Enough wallowing around already. Geez! I have been planning on this store for years. I received a phone call last July, Deb C., the owner of this building, called me and said, “Why don’t you look at my building? I’m ready to sell.” I drove down in a hurry. She was with a customer. I stood there and looked around. Something caught my eye. Where the meat counter is now, and up on the right wall, was written half of a quote. Deb never finished it. I won’t either. It will stay here long after I’m gone. You should take a look some time. Everybody must have standing behind me in spirit. Mom, Dad, Miss Jane, and those I’ve lost. I made up my mind about getting this building somehow, right then. It reads….LIFE ISN’T ABOUT WAITING FOR THE STORM TO PASS. Please come see me often. Life’s pretty wonderful up here too. Questions, comments, concerns? Shoot us an email at vmmc@villagemeatmarketcafe.com.